The standard SE Bernie Marsden is a cracking guitar - this ups the audio quality, and here's hoping we see more limited runs like this. Very competent build. Superb old-school vintage-y tones. Those bird inlays will always divide opinion. The new version of the SE Bernie Marsden 53/10 (limited to just 50 pieces) is equipped with USA-made PRS 53/10 humbuckers, the darkest sounding of the PAF-style series that started with the 57/08s. It also adds coil-splits, which aren't available on the standard model. 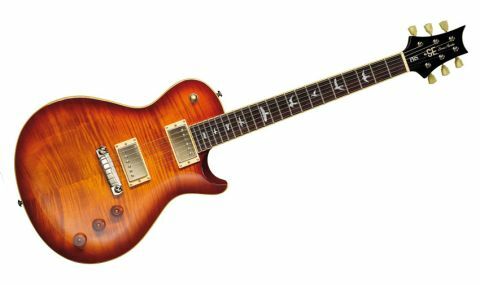 Just over a decade ago, Gibson and PRS locked horns over the 'legality' of PRS's clearly Les Paul-inspired Singlecut that was introduced in 2000. The result - eventually - went in PRS's favour and means that the Singlecut, in all its various USA-made and Korean-made guises, is now very acceptable and legit. "PRS's Korean-made SE line has grown from its introduction in 2001 to overtaking the USA-made guitars in terms of sales"
But plenty has changed in that past decade. PRS's Korean-made SE line has grown from its toe-in- the-water introduction in 2001 to actually overtaking the USA-made guitars in terms of sales and, perhaps more importantly, to provide PRS with a price point that's perfect for these cash-strapped times. PRS's obsession with quality means it cannot make a guitar in the USA under £1,000. However, with its Korean partner - World Musical Instrument Co - it's got the three-figure PRS SE guitars down to a fine art. This SE Bernie Marsden released in 2012 hints, however, at a new direction: an intention to bridge the gap between the great-value Korean guitars and the USA- made start-up models, with even the now-discontinued 'Stripped' 58 Singlecut costing over three times as much as the standard SE Bernie Marsden. So, by adding USA-made PRS pickups, installing a coil-split and factoring in a detailed UK setup, for just shy of £1,000 you have a concept that could bridge that considerable gap. "PRS's SE certainly has an 'upmarket' vibe, with a flamed veneer maple top and the bound body"
The SE Bernie Marsden 53/10 has a spacious cutaway; a broad waist, while the top is flatter in the centre, more chamfered, really - very different to the curvature of a USA-made PRS Singlecut's top. Then there's the all-important mahogany/maple ratio to consider: with the mahogany back 44mm thick, it leaves 11mm of solid maple topped with a subtly flamed veneer. Thickness aside, the appearance of the maple top obviously contributes to the look of the instrument. PRS's SE certainly has an 'upmarket' vibe, with a flamed veneer maple top and a bound body and fingerboard edges that are virtually exclusive to this model in the PRS line-up. PRS's SE certainly has an 'upmarket' vibe, with a flamed veneer maple top and the bound body: a polyester base coat with an acrylic top coat - but far from gloopy. The back is three-piece and finely jointed. There's little edge radius to the top-bound edge, although the back edge has a Fender-like radius, which adds a little comfort played seated. We also have a subtle ribcage contour. The tenon is not only full width, but extends under the neck pickup - clearly visible when it's removed. Easily noticeable, the heel of the neck is quite large and curves into the cutaway. Dimensionally, the Wide Fat SE has a neck depth at the 1st and 12th frets of just over 21mm and 24mm, respectively. There's a subtle V'ing to the shoulders of the SE neck that actually makes it feel smaller than it is, while the 254mm fingerboard radius, wide, low frets and reasonably low action all contribute to the playability. As do the rounded fret ends. "There's a stately tone here from the strong bark of the bridge pickup to the almost hollowbody-like plumminess of the neck humbucker"
We're already fans of the 53/10s and on this platform, they produce some superb sounds. If you like your single-cut tones creamy, responsive and a little on the dark side, then you might well have found your dream. There's a really stately tone here from the strong but not overly bright bark of the bridge pickup to the almost hollowbody-like depth and plumminess of the neck humbucker. Both volume controls clean up very easily, and pulling up the tone control to split the coils - voicing the screw coils of both - throws in a funky, cleaner, ringier element that's quite uncharacteristic of a traditional Les Paul-style guitar. But with a few pedals in line, the versatility is impressive - really good dynamics, very responsive. The guitar isn't overly impressive in terms of tuning stability - the nut creaks a little, and the tuners feel a little soft, too. But as the instrument settles down during our play tests, it becomes more acceptable. The SE's three-control setup isn't quite as versatile as a traditional four-pot setup of an LP-style guitar and the volumes - especially the bridge pickup's volume - is very interactive with the tone control, creating a couple of rather odd sounds. Also, unlike the USA guitars that use the 53/10s, the coil-split is exactly that, as opposed to the partial tap of the USA models. Strangely, that simple circuit isn't employed here.